Gift of Eliot Stellar conveyed in six parts, viz., March, 1987; December, 1989; October, 1991; November, 1992; March, 1993; and December, 1993. 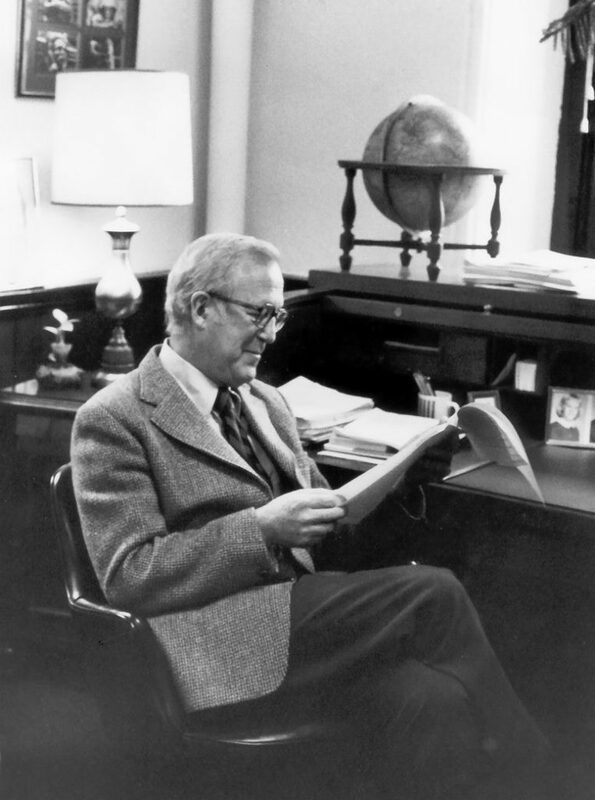 The papers of Eliot Stellar, former provost and professor emeritus of neurological sciences at the University of Pennsylvania, are arranged in eight series. They are Biographical and Personal File, 1982-1993 (0.4 cubic ft.); Administration, 1949-1993 (6.6 cubic ft.); Correspondence, 1956-1993 (7.5 cubic ft.); Addresses and Writings, 1941-1993 (1.5 cubic ft.); Teaching Material, 1948-1993 (2 cubic ft.); Research Files, 1938-1993 (9.5 cubic ft.); Other organizations (non-University organization work), 1948-1993 (17.5 cubic ft.); Video tapes and Memorabilia, 1990-1991 (2 cubic ft.). The majority of the series are arranged alphabetically by subject. Eliot Stellar was born in Boston, Massachusetts, on November 1, 1919. He entered Harvard University in 1937. At Harvard he began his lifelong research in physiological psychology. It was his work with Clifford P. Morgan, his Harvard tutor, in Karl Lashley’s laboratory that convinced him to study brain mechanism of human and animal behavior. After graduating from Harvard in 1941, he entered Brown University and received a Master of Science degree a year later. Months after getting his Master’s degree, Stellar joined the National Defense Research Council (NDRC) and conducted research into submarine crew selection. After serving six months he left the NDRC and went into the Air Force, serving as a Classification Psychologist from 1943 to 1944. Beginning in 1944, Stellar served as a psychologist in the Office of Strategic Services (OSS) until February of 1946, when he returned to the academic world. Stellar returned to Brown to continue his graduate studies in the subject which had interested him earlier, physiological psychology. He conducted a number of investigations into the motivation of food hoarding, writing his dissertation on “The Effect of Altering Metabolic Rate on the Hoarding Behavior of the White Rat.” He received his Ph.D. in psychology in 1947. Stellar began his academic career in the Psychology Department at Johns Hopkins University, which was then being revitalized by its new head, Clifford T. Morgan. With Morgan, Stellar rewrote and updated the second edition of Morgan’s textbook in physiological psychology. That second edition, known as Morgan and Stellar’s Physiological Psychology, was published in 1950 and was for many years the only text in the field. In 1954 he published an essay entitled “The Physiology of Motivation” in the Psychological Review, which pinpointed the hypothalamus as the center of motivation and suggested an integrative neuroscientific strategy for the investigation of motivated behaviors. This essay has recently been selected by the Review for publication in its centennial edition as one of its eight most influential papers of the twentieth century. In 1954, Stellar was appointed to the post of associate professor of physiological psychology. He continued to work at Johns Hopkins until 1960 when he was offered the post of professor of physiological psychology in the Department of Anatomy at the University of Pennsylvania. Eliot Stellar’s connection with the University of Pennsylvania, however, predated his 1960 appointment. While working at Johns Hopkins, he and a group of faculty members had attempted to start a center for interdisciplinary approaches to physiological psychology. Finding Hopkins officials unresponsive to this idea, a number of the proposers of this center went to the Institute of Neurological Sciences (now known as the David J. Mahoney Institute) at the University of Pennsylvania. Dr. Stellar joined them in 1954 and conducted much of his research at the Institute. In 1965, five years after his appointment at the University of Pennsylvania, he became the director of the Institute, which position he held until he became Provost. Stellar’s career at the University was not restricted to his teaching in the anatomy department. As head of the Institute of Neurological Sciences, his work had caught the eye of University President Martin Meyerson. In 1971 Meyerson appointed Stellar co-chair of the Development Commission formed to chart the strategic course of long-range planning at the University. When the Commission’s work was completed and the previous provost resigned, Meyerson appointed Stellar in 1973 to the post of Provost with the task of implementing the Commission’s findings. Stellar spent the next five years guiding the University through the Commission’s vision of “one university.” In 1978, feeling he had accomplished all he could, Stellar resigned his post as Provost. Stellar returned to teaching in the department of anatomy and engaged in more extensive research in neuro-sciences. From 1979 until his death in 1993, Stellar concentrated on the neuro-biological interactions underlying human and animal behaviors, a distinct feature being the study of salt appetite. His closest colleague at the University of Pennsylvania was his former student Alan Epstein. After Epstein’s sudden unexpected death in a car accident in early 1992, Stellar took over the salt appetite project, of which Epstein had served as the program director. In this period, he was also a senior member of a nation-wide mental health research network project on health and behavior, financed by the MacArthur Foundation. In addition to scientific research, Stellar continued his involvement in University administrative functions. He served on a number of committees, among them the Advisory Committee of the Department of Anatomy, the Benjamin Franklin/Lafayette Seminar, the Nencki Institute for Experimental Biology exchange program, the University Scholars Committee, and the Thouron Award American Selection Committee. In 1990, at the age of 70, he accepted the offer of appointment as Chair of the Department of Anatomy, which was soon thereafter renamed the Department of Cell and Developmental Biology. Stellar’s influence went far beyond the University campus. He served on a wide variety of national and international committees and boards. One of his earliest positions was president of the Eastern Psychological Association from 1965 to 1966. After his term as University Provost, he became more actively involved in consultation work. Some of the more prominent organizations with which he was affiliated include the MacArthur Foundation (as a grant evaluator), the National Research Council Committee on Man-Food Systems Interactions, the Society for Neuroscience, and the Tott’s Gap Medical Research Laboratories. Stellar dedicated much of his time in his later years to the American Philosophical Society, serving as its President from 1987 to 1993, and to the Human Rights Committee of the National Academy of Sciences (NAS), serving as its Chairman from 1983 until the end of his life. In his work for the NAS he actively lobbied for the freedom of scientists to conduct their work throughout the world. On many occasions he interceded in behalf of imprisoned scientists who were in danger of losing their lives or suffering great hardships. Stellar earned widespread acclaim for his achievements. He received numerous medals and awards, among them the Warren Medal of the Society of Experimental Physiologists in 1967 and the American Psychological Foundation’s Gold Medal for Lifetime Achievement in 1993. The Eliot Stellar Papers, 1938-1993, document the professional activities of Dr. Stellar — his teaching, research, his administrative duties at the University of Pennsylvania, as well as his responsibilities with other organizations outside the University. The papers relating to his tenure as Provost of the University, 1973-1978, are generally to be found in the records of that office. The Biographical and Personal File, though small in size, provides an overview of the long and fruitful academic career of Eliot Stellar. Included are his curriculum vitae, correspondence concerning his numerous appointments, a transcript of an oral history interview, and records of celebration activities in honor of his seventieth birthday. The Administration series consists primarily of records relating to the several posts he held at the University from the 1970s until the end of his life. Among his major responsibilities are Benjamin Franklin/Lafeyette Seminar, Institute of Neurological Sciences, Nencki Institute for Experimental Biology, Research Foundation Board, School of Medicine administration, Thouron Award, and the University Scholar program. The Correspondence file contains letters relating to Dr. Stellar’s professional work throughout his career. A prominent subseries in it is the large number of recommendations he wrote for his students and colleagues. The Addresses and Writings series consists of two speeches, manuscripts of a large number of articles, parts of books Stellar wrote or contributed to, and reprints of articles published from 1941 to 1993. The series of Teaching Material covers his entire career from his appointment at Johns Hopkins University to his final years at the University of Pennsylvania. It consists principally of course syllabi and teaching notes. Stellar’s Research files comprise three subseries, namely, grant projects, notes, and reference material. Major research projects in which Stellar participated include the head injury project, 1981-1986; the mental health research network project on health and behavior funded by the MacArthur Foundation, 1983-1993; the National Institute of Health (NIH) project on appetitive and consummatory food motivation, 1987-1992; NIH project on eating patterns, 1988-1991; and the National Institute of Mental Health project of research on neurohormonal mechanism of ingestive behavior, 1988-1993. The research notes, dating back to days when he was an undergraduate at Harvard, include original data, figures, and graphs for many of the experiments he conducted. The largest group of material in the collection concerns the work Dr. Stellar did for a number of professional organizations outside the University. The bulk of the material in the Other Organizations series is related to his responsibilities with the American Philosophical Society, the MacArthur Foundation, the National Academy of Sciences and its Human Rights Committee, the Institute of Medicine, the Board of Trustees of Ursinus College, and the Whitefall Foundation. The Videotapes and Memorabilia series consists principally of video cassettes and sound tapes, all related to a tribute made in honor of Stellar’s seventieth birthday. The celebration activities were held twice, first in June 1990, and again in November 1991. National Academy of Sciences (U.S.). Committee on Human Rights. University of Pennsylvania. Dept. of Anatomy. University of Pennsylvania. Dept. of Cell and Developmental Biology. University of Pennsylvania. Institute of Neurological Sciences. Does Glutamic Acid Have Any Effects on Learning? Figures and diagrams re hypothalamus, etc. Norgren, R., papers on CCK tests, etc.